A man from Wiltshire who wants to end his life is to give evidence to the Commission on Assisted Dying. 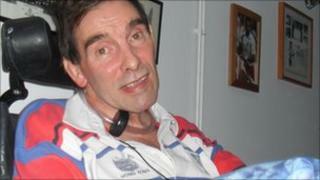 Tony Nicklinson, 56, from Melksham, has "locked in syndrome" after suffering a stroke in June 2005. Mr Nicklinson said he did not see why he should have to travel to another country to end his life. "I am already a cripple. Any civilised society would look after its cripples and not send them overseas so they cannot be seen," he said. He added: "How much more must I give to take away the guilt of the able-bodied? "Do I have the strength to carry on? Yes, because there is a fundamental injustice with the present law. "If you need assistance to die, the right to choose where, when and how you die is immediately taken away from you and that is wrong. "A new law should restore the right of self-determination and would also help to protect those people who need protection. "Once this is sorted out people like me can die in peace," he added. Mr Nicklinson suffered a catastrophic stroke in June 2005 whilst on a business trip to Athens, Greece. It left him paralysed below the neck and unable to speak unaided. The Commission on Assisted Dying is chaired by Lord Falconer. It will consider what system, if any, should exist to allow people to be assisted to die, and whether any changes in the law should be introduced. The inquiry runs until September 2011. A spokesman for the campaign group Care Not Killing said it did not support any loosening of the current laws because they acted as a powerful deterrent and protected the vulnerable, elderly and disabled. "The vast majority of groups opposed to assisted suicide and euthanasia are boycotting the commission. "We do not believe it is impartial with nine out of its members having pro-assisted suicide views and important experts in palliative medicine being been excluded," he said.